For over 45 years, McKinsey & Company’s Gene Zelazny has been showing McKinsey consultants and professionals around the world how to plan, design, and deliver effective business presentations and how to improve and expand their repertoire of presentation skills. 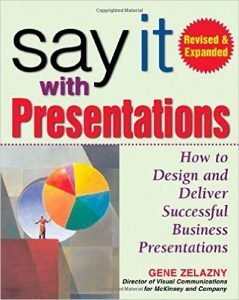 Now in this revised and expanded edition of Say It With Presentations, Mr. Zelazny brings together his years of valuable communication experience to show managers_even those with little or no presentation experience_how to prepare winning presentations using his proven methodology and the full range of PowerPoint techniques. Written in a clear, highly engaging style, this essential business tool covers everything from defining the situation to developing the right mix of visual aids to interest your audience without overpowering them. This book shows you how to put your message in visual form and translate information and ideas into persuasive, powerful charts, visuals, and multimedia presentations - holding your audience's attention as you communicate exactly what you want, with no confusion.